This card and the one below fits well for the latest Flourishes challenge which is to use cut edges on your card - here I have used different nestabilities. In this card I stamped the smaller flower image as my background in PTI's scarlett jewel ink and really like the pattern it made. The sentiment is from Verve stamps. Thanks for stopping by and not deserting me since I have been awol! These are both so pretty. I love the way you created your own designer paper on the second one. Thanks for joining us at Flourishes. Hope to see you Thursday night at the release party on Splitcoaststampers. So beautiful and exquisite colouring too. I really love the sweet pea background you created - very classy! Both of these are wonderful. This is my all time favorite set and you did them proud! 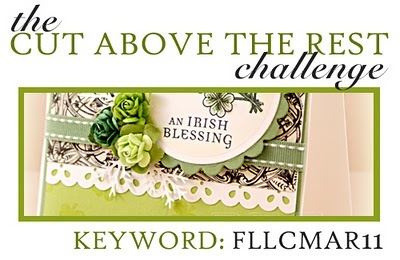 Thanks for playing in Flourishes A cut above the rest challenge. Such great cards with the Sweet Peas set! I love all those sweet soft pinks in the first card, and great use of the layout in the 2nd! What a beautiful job you did on both these cards! Such delicate and lovely images. 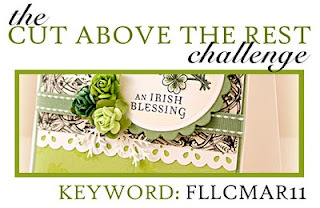 I'm so glad you joined us for Flourishes Cut Above challenge! Chris, your cards are beautiful! Love the design and your coloring of the images. How to keep your partner busy!